To all of you that don’t know me, I’m Chef Dennis and it’s my great pleasure to be here today guest posting on Jenny’s blog, Savour the Senses! I don’t get to do too many guest posts because of the time constraints of my job, my blog and well you get the picture….hectic is not the word! When Jenny asked me about guest posting and told me the date, I was overjoyed because it fell right into my spring break, let’s call it perfect timing! So I made this lovely cake, and even added a little more coconut to the topping (I was feeling reckless!) Took my pictures and devoured a slice (or two) and promptly gave away the rest to neighbors…..just like it never happened….sigh. It was a very tasty cake, the flavors of coconut were subtle, and the fresh pineapple went perfectly with this not overly sweet cake. The Frosting had hints of coconut, and as I mentioned in the recipe, I think toasting the coconut would not only have helped the flavor but also the appearance of the cake, adding some contrast. I also think that a good brushing of pineapple juice and dark rum would have kicked up the cake another notch, so I would definitely advise doing that too. That was mentioned in the original recipe by Smitten Kitchen. Thanks so much for sharing your blog with me today Jenny, I hope your readers enjoy the cake as much as I did! Mix together flour, baking powder, baking soda, and salt in a medium bowl. In the bowl of your mixer, beat the softened butter and brown sugar at medium to high speed until pale and fluffy. Add the eggs one at a time, then add the rum. Add the dry ingredients, one third at a time, mixing and scraping down bowl between additions. Do not overmix, mix only long enough to incorporate the dry ingredients.. Spread batter evenly in the prepared pan. Bake until golden and a tooth pick or skewer inserted in center of cake comes out clean, 40 to 45 minutes. For the frosting, in the bowl of your mixer, whip the cream cheese and mascarpone until light and fluffy. *Coconut milk is not a substitute for cream of coconut *canned pineapple may be substituted *If the cake will not come out of the pan easily, place it on one of the burners of your stove for about 15 sec (depending on how hot the burner is), this will loosen the cake from the pan. *I did not do this but the original recipe suggested brushing the cake with a combination of pineapple juice and dark rum, this would have helped the flavor. 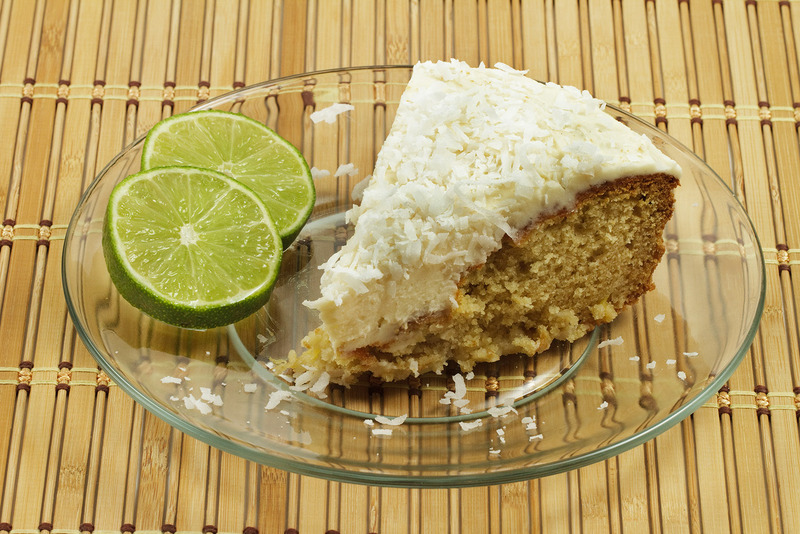 *toasting the coconut would help not only the appearance of this cake but the flavor. This is the perfect guest post for my Hawaiian adventure. Thanks for being a part of my Featured Foodie Friday Chef Dennis, I am so happy you were able to stop by! If you or somebody you know would like to be a part of Featured Foodie Friday please e-mail me at savourthesenses (at) gmail (dot) com and we can get you scheduled! Yumm!! Yes my “extra” goods usually go to friends and neighbours…I’d be a mountain if I didin’t. Nothing says “tropical” to me like the flavors of a Pina Colada. (Bonus points for being in a CAKE!) Jenny, thank you for hostessing Chef Dennis, and Chef Dennis thank you for this wonderful recipe. Aloha! This cake looks delicious, Chef Dennis! 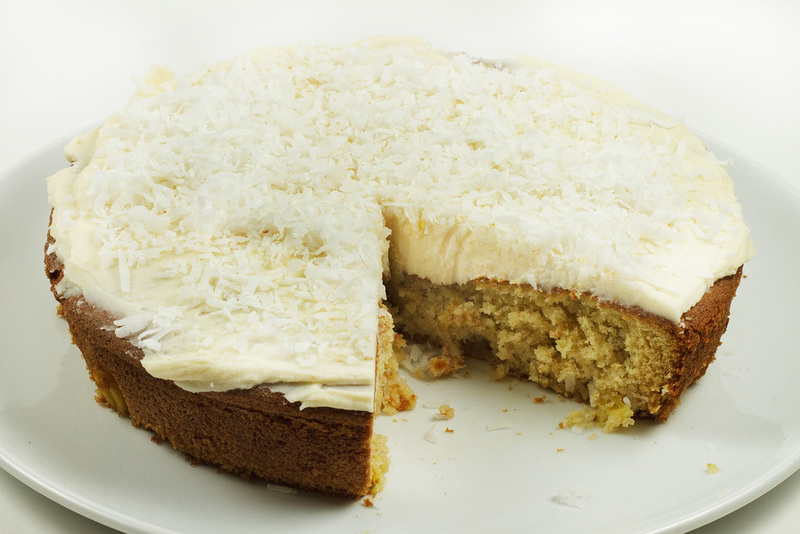 I adore coconut, so this cake is calling to me. Chef Dennis, this is truly a mouth watering cake … imagine having this cake with iced coconut water …that would be heavenly! 😉 thanks for recipe. Wonderful choice of recipe for a guest post. I do love all things tropical, so no doubt this would be a winner at our house. Also, I like that extra tip with the rum and pineapple juice-yum! Jenny, thanks for having Chef Dennis guest post over here so we could see this marvelous cake recipe! I hope both of you are enjoying the weekend! Okay so can I have Lisa’s piece then? Cuz I love me some coconut. I could eat it every day. This looks so yummy and makes me want to jet off somewhere warm. If only I had a jet. I love that saying too. I always tell hubs that but it hasn’t sunk in yet. Jenny- Thanks for convincing the dude to guest. I was jumping for joy when I saw the coconut. Ha! That sounds like me and my husband. He HATES coconut, so I would end up doing the same thing! I love it though, and would gladly accept this cake from you if I was your neighbor! Oh my goodness, I am so glad I came over from your blog site, Chef Dennis! This is absolutely amazing! And the recipe seems so easy. Must try this.I Your cake recipes are so dependable! Thanks again for sharing . I’m sure it will be a hit here at home! fantastic guest post, chef dennis sent me over – my husband hates coconut too – we’ve been married 15 1/2 years, he said he might give it another try…maybe…maybe not…and then made a scrunchy face. le sigh. ah well. I love coconut and have been stuck indoors with cloudy weather and this made me dream of a tropical vacation for sure….have a glorious week! I like it that you changed the frosting to one with cheese in it — I love Smitten Kitchen, but I don’t like powdered sugar glaze at all. Good job. I live in Russia, so we don’t have “cream of coconut in cans”. How can I make it myself? Please help or I will not be able to make this cake. Thanks! My husband stumbled across this recipe and we gave it a try. Very yummy, indeed, but I have a few questions. You never actually indicate in the recipe when to add the pineapple. I just added it into the cake batter. Also, what does the (10 x) by the powdered sugar mean? Do you actually add powdered sugar 1/2 cup at a time, 10 times? I only put it 1/2 c, seemed okay. We would love to try this again, but want to be sure about the recipe first! Thanks! 10x is a type of powdered sugar, sorry for any confusion! Do you have coconut milk in cans? That is pretty much what that means. If not maybe substitute heavy cream? I am not sure if that would work but it could be worth a try! I’m so glad I checked back to see if you had replied because we love this recipe! We shared the cake with friends and they devoured it! I’ve never heard of 10x powdered sugar, so that’s good to know! Thank you so much! !